Copyright © 2019 Hockey Players Club. All rights reserved. SAVE 10% ON YOUR NEXT PURCHASE! Join our growing community of hockey players by creating a player profile. Once complete (profile picture and hockey gear included), you'll automatically SAVE 10% on your next purchase! Join our growing community of hockey players by creating a player profile. 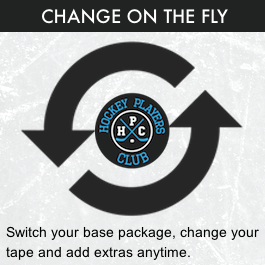 Once complete (profile picture and hockey gear included), you'll automatically SAVE 10% on your next purchase! You must have an autoship tape package in your cart. Want exclusive access to epic deals and HPC sales? Join our mailing list!